Should I Remove the Flower Stem From My Basil Plant? What Fertilizers Do Basil Plants Need? An herb garden would not be complete without at least one kind of basil. As a basil plant becomes established, it will begin a stage of rapid growth. It is important to trim a basil plant properly to encourage it to grow out and full instead of up. It is also imperative to remove the basil blossoms as they appear because if left to blossom, the basil plant will stop producing. Watch as the basil plant becomes established. Do not trim until it reaches a height of approximately 6 inches. Find a pair of large leaves located near the top of a stem. Trim the leaves off from the stem immediately above where the leaves are located. When you trim the basil plant in this fashion, two more stems will grow out from this point, which will create a larger and bushier basil plant. Remove blossoms as soon as possible after they appear. Count five leaf nodes down the stem from the blossom and trim off the stem at this point. This will encourage the plant to produce more leaves instead of more blossoms. Monitor the basil plant throughout the entire growing season and repeat Step 2 once or twice each week to keep the basil plant producing leaves. Wait until the basil plant is about six inches tall before you prune it. The more pruning occurs, the more bushy and healthy it will become. Always cut off any flowers that grow so it doesn't affect the herb's flavor. Pinch basil leaves from the top of the plant every couple of weeks to encourage healthy growth. Prune the plant when it becomes bushy enough to take over its pot, or when it appears overgrown. You can either use the leaves right away or freeze them. Prune the basil plant by cutting three inches up from the bottom, leaving a few inches of leaves left on the plant. You will need to do this every month or so. Continue to pinch basil leaves off the top of the plant after pruning. Pinching leaves periodically is a good habit to start in order to promote healthy growth. Remove the flower stem from your basil plant if you are growing it for culinary purposes, recommends University of Illinois Extension horticulture educator Susan Grupp. You can also leave basil flowers and leaves alone and enjoy the plant as an ornamental. Wash the basil leaves so they are free of dirt, insects and debris. Boil a pot or large saucepan of water. Prepare an ice bath in a bowl with several handfuls of ice and water. Have the ice bath prepared before you blanch the basil. Plunge the basil leaves into the boiling water for 15 seconds. Remove them immediately with a slotted spoon and put them into the ice bath for 10 seconds to stop the cooking. Lay out the basil leaves onto paper towels to dry. Pat dry to hasten the process. Alternatively, squeeze the leaves dry between paper towels. Pinch off the tops of the plant with your fingers when the plant is around 5 to 6 inches tall. This will encourage the plant to bush out. Schedule the harvesting of the basil for drying before the flower opens. If you don't intend to dry the basil leaves, it can be cut at any time. Wipe the blades of your kitchen scissors with rubbing alcohol to sanitize. Cut off as much of the top of the plant as you wish to harvest, leaving at least the bottom 6 inches of the plant undisturbed. Strip the leaves from the stems you’ve removed if you intend to use them as seasoning. Discard the stems. Plant basil seeds in a sunny location after all threat of frost has passed. Basil needs an average garden soil or general potting soil. Cover the seeds with 1/4-inch of soil and space the seeds approximately 1 inch apart. Spray the soil with the spray bottle to keep the soil evenly moist. Watch for the seedlings to emerge about one week after planting. Thin the seedlings to a spacing of 6 to 12 inches apart when six leaves have grown on the plants. Plant basil plants in a sunny location after the last spring frost. Dig a hole slightly larger than the basil plant's root ball. Remove the basil plant from the temporary container and carefully loosen some of the roots from around the edges of the root ball. Place the basil plant in the hole so that it is at the same level that it was in the temporary pot. Refill the hole with dirt and water generously. Press the dirt down firmly around the plant. Pinch off flowers with your finger and thumb. Basil tastes bitter if it is allowed to flower. 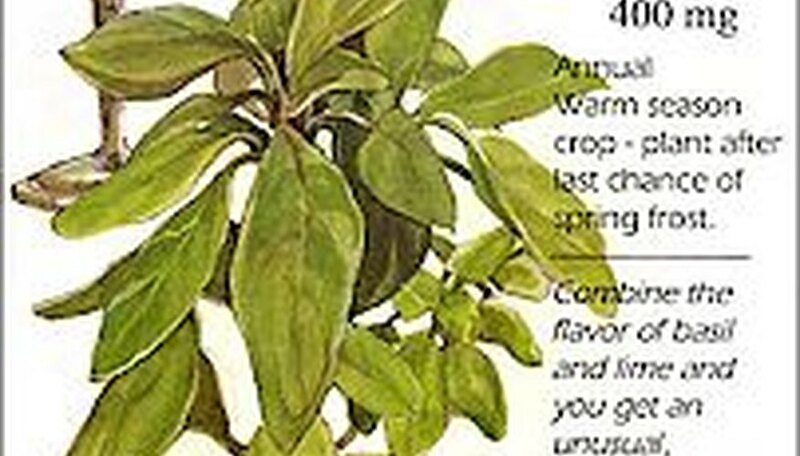 Harvest green basil leaves from spring until fall whenever you want. Harvest by pruning the desired amount about a quarter-inch above a leaf node. Use hand clippers. Prune basil heavily with hand clippers to about a quarter-inch above the second set of leaf nodes from the bottom. Pruning will stimulate fuller, bushy growth. Repeat this heavy pruning every two to three weeks, at a minimum. Drop the basil seeds onto the soil in a seed starting flat or in a prepared bed. Space the seeds 1 to 2 inches apart. Cover the seeds with a 1/4 inch of light top soil or vermiculite. Thin the seedlings to 12 inches apart when they are 4 to 6 inches tall. Transplant the seedlings you remove during thinning, or take the young plants to the kitchen. Space multiple rows of basil plants 2 to 3 inches apart. Alternately, create a 3-foot-wide bed and space the plants 12 inches apart. As basil grows, it eventually produces flowers and seeds. These flowers may have some ornamental value, but from a culinary standpoint, they mark the end of the basil season. Once the plant begins producing flowers, the leaves become bitter and less appealing. Pinch the plants back every two to three weeks to form a compact bushy plant and prevent flowering. Lack of sufficient water may stress basil plants and cause them to produce flowers prematurely. Water basil plants in the garden at least weekly, or as needed, to keep the soil evenly moist. 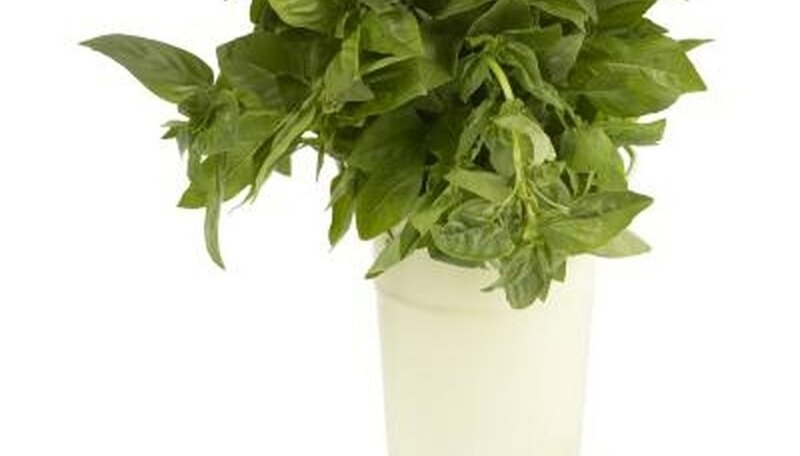 Water container-grown basil daily, if necessary, to keep the plant moist. Basil originated in the humid climate of India and needs warm, moist conditions. Flowering is the most likely cause of a bitter taste, but basil leaves vary considerably depending on the variety. Sweet basil is the most commonly grown basil, but if you accidentally planted another variety, such as cinnamon basil or spicy globe basil, the taste may come as an unexpected surprise. Once a plant begins flowering, the only solution is to pull it up and discard it. To prevent flowering in the future, plant the basil in full sun and water it regularly. Make several plantings two to three weeks apart for a steady supply of basil throughout the summer. Plant frost-tender basil only after the last expected frost. Bring it indoors for the winter or treat it as an annual. Under ideal soil conditions, basil plants need little to no fertilizer. A moist, though not sopping wet, soil that's well mulched and a bit sandy is preferable. A pH range of 5.5 to 8 typically provides all the essential nutrients the plant needs. If the soil lacks these nutrients, however, add fertilizer. If you determine the basil plant needs fertilizer, use one that's granular, slow-acting and water-soluble. In some cases, a diluted liquid fertilizer produces desirable results. A granular fertilizer used on basil plants needs an NPK (nitrogen, phosphorous and potassium) rating of 10-10-10 or 10-10-12. 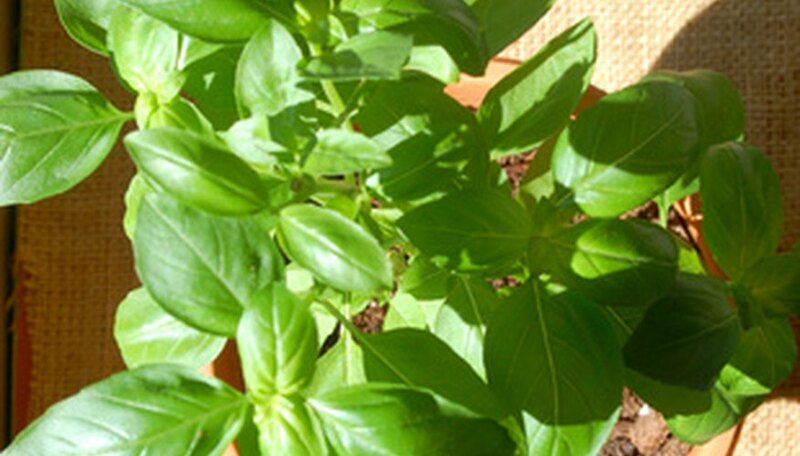 Organic fertilizers produce favorable results when applied to basil plants. Apply fertilizer to basil plants once at the initial planting, and additionally every four to six weeks. For granular fertilizers, apply a small handful of the granules to the area around the base of the plant and water them in, ensuring none of the granules settle on the plant leaves. If you have a large plot of basil plants, use 1 1/2 lbs. granular fertilizer per every 100 square feet of plants (for containers, a small handful of granules will suffice). Apply liquid fertilizers and along with the regular watering. Over-fertilizing a basil plant leads to excessive leaf growth and less flavorful harvested basil. 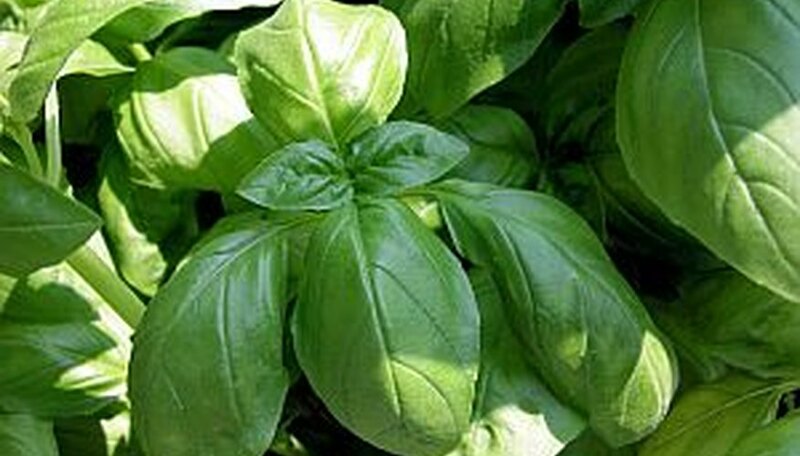 Also, over-fertilizing leaves the basil plant more prone to fungal and mold infection. Never apply fertilizer at temperatures below 60 degrees F, as this leads to spur fungal and mold growth. Avoid fast-release and artificial, synthetic or inorganic fertilizers, as they produce overly large leaves that lack in flavor compared to their smaller counterparts. When choosing a mixture of herbs to plant together in a container, it is important to choose plants that have similar water, soil and sunlight needs and that grow well in containers. 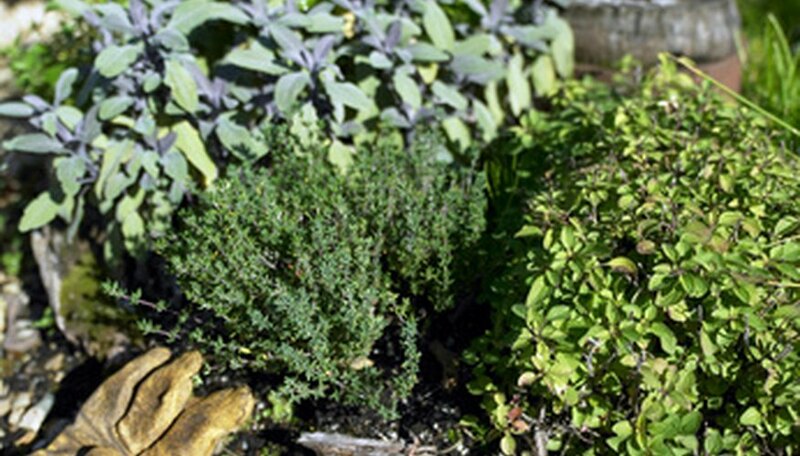 A good mixture for the new grower is parsley, sage, thyme, savory and oregano. Basil can be added if the container is large. Avoid overcrowding basil, as it needs good air circulation. Expose the basil plant to at least six hours of sunlight each day, as it thrives in the warmth of the sun and can die even in a mild frost. Keep the basil plant in well-draining, moist soil, but do not saturate it. Add 2 inches of organic mulch (3 inches if you have a variety that grows 2 feet tall) around the basil plant to inhibit weed growth and retain warmth and moisture in the soil, especially if the plant is outdoors. Pinch off the center leaves of the plant to encourage the basil plant to grow bushy side leaves rather than flower stalks. Clip off any flowers that develop. Rinse off any chewing bugs, such as aphids, with a strong stream of water as soon as possible. 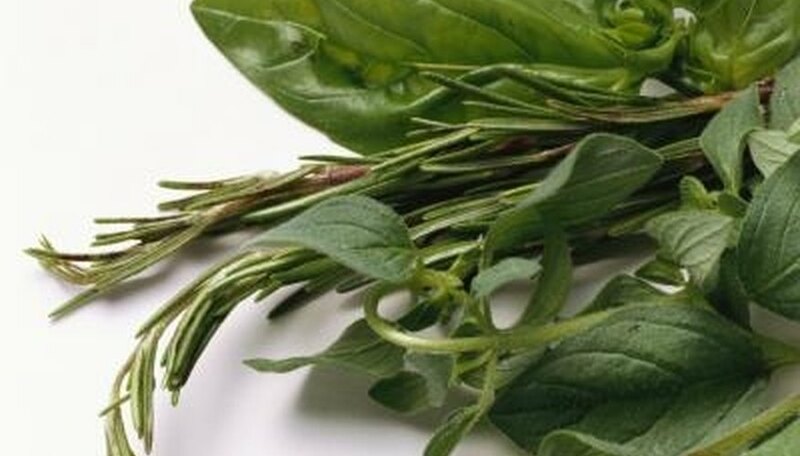 Dig up the plant and surrounding soil and dispose of both if the basil plant develops dark steaks on the stems. These are symptoms of Fusarium wilt, which cannot be cured. This rare and tasty basil will work wonders in vinegar and with fish, salad dressings, sauces and oils. It is a delight in salads! Lime basil also works well in other standard basil dishes, including pesto. Desserts are a perfect addition for lime basil. Can be grown inside during the winter in a warm, south window or under florescent lights. Also a good container variety. Remove all grass, weeds and large rocks from the planting site. Use a garden fork to loosen the soil to a depth of 5 to 6 inches. Amend the soil with a 3- to 4-inch layer of organic compost. Sprinkle the basil seeds across the planting site and cover with a 1/8-inch layer of soil. Water until the soil is moist, taking care not to bury the seeds too deeply. Continue to water the seeds anytime the soil looks dry. Seedlings should start to appear within five to 10 days. Thin the seedlings, leaving 9 to 12 inches of space between each plant. Water the basil seedlings whenever the top inch of the soil feels dry to the touch. Add a 2- to 3-inch layer of organic mulch when the plants have reached 3 to 4 inches tall. Add an application of slow-release fertilizer once the seedlings have become established. What Do I Do With the Basil Stems & Flowers?